Kendra Ainsworth is an emerging curator and interpretive planner working in the arts and culture sector in the GTA and 905 region. She is currently the Assistant Curator at the Art Gallery of Mississauga. She holds a Masters in Museum Studies from the University of Toronto with a focus on interpretation of contemporary art. Through her practice Kendra aims to remove both intangible and tangible barriers to public engagement with contemporary art, and allow it to serve as a catalyst for community building and intellectual development. Recent projects include Scotiabank Contact Photography Festival Featured exhibition Fausta Facciponte: Six Characters in Search of a Photograph at the AGM, and Infinite Daydreams | Reflections on the Sublime Imaginary, at the Art Gallery of Burlington. Adam Barbu is a writer and curator based in Ottawa. He has produced exhibitions nationally and internationally that explore themes of displacement and cultural memory. Recently, he was the curator in residence at the Parque Cultural de Valparaíso (Valparaíso, Chile) and currently works for contemporary art space La Petite Mort Gallery. His current research focuses on “post-AIDS” discourses, early minimalist art and Derridian deconstruction. He will be pursuing an M.A. and Ph.D. in Art History at the University of Toronto starting fall 2015. Amy Beingessner is an MA candidate in the Art History and Visual Culture program at the University of Guelph. During her undergraduate studies in communications at the University of Ottawa Amy also pursued fine art courses at the Ottawa School of Art, design courses in Florence, Italy, and worked at a non-profit organization in Paris, France, dedicated to providing quality publicity to emerging musicians and artists. She completed her degree in 2005, then spent several years travelling and working before deciding to take up the challenge of studying art history full-time. Her primary focus is on the relationships we form to material works of art, especially those we deem to be historically significant, and how these relationships form ideas about cultural identity. Amy hopes to complete her MA this spring and to continue studying our stunning visual world. Alison Cooley is a critic, curator and educator currently based in Toronto. She holds a BA in Studio Art and Art History from the University of Saskatchewan, and an MA in Art History from York University. Her research deals with art and the nature-culture divide, socially-engaged artistic practice, epistemological tools such as Google search and internet memes, and experimental critical and curatorial practice. She was the 2014 recipient of the Middlebrook Prize for Young Canadian Curators. Her writing has recently appeared in FUSE, Canadian Art, Blackflash, and the Journal of Curatorial Studies. She is the host and producer of What it Looks Like, a podcast about art in Canada. Frances Dorenbaum was born in Toronto. She earned a Combined Honours BA in English and Spanish from the University of King’s College in 2012, and is currently a Master of Arts candidate in the department of Modern and Contemporary Art History, Theory, and Criticism at the School of the Art Institute of Chicago. She has a special interest in contemporary photography. Her essay, “Images of Hair in John Donne’s Work” can be found in the 2012 issue of Verso, Dalhousie’s journal of literary criticism, and she currently writes for SAIC’s F Newsmagazine. Gregory Elgstrand has curated and organized numerous exhibitions across Canada and his writings on art and architecture have been published by Canadian Art, C, the Palais de Tokyo, YYZ, the Glenbow Museum, Stride Gallery and the University of Calgary. In 2012, he co-edited with Dave Dyment, One for Me and One to Share, a survey of artist multiples published by YYZBOOKS. Elgstrand is currently Curator at the Art Gallery at Evergreen and founder Editor of Bohart, published in Port Moody, BC. He has served as Director of YYZ, as Director/Curator of the Art Gallery of Calgary (AGC), Director of Truck in Calgary and Coordinator of Struts Gallery in Sackville, New Brunswick. In 1993, he and screenwriter, playwright and director Kris Elgstrand, co-founded AH UM Theatre in Vancouver. Elgstrand studied at the Emily Carr College of Art and Design, Simon Fraser University and the Nova Scotia College of Art and Design. Soheila K. Esfahani grew up in Tehran, Iran, and moved to Canada in 1992. She received her Master of Fine Arts degree from the University of Western Ontario and her BA in Fine Arts from the University of Waterloo. She is a recipient of grants from the Social Sciences & Humanities Research Council of Canada, the Ontario Arts Council, and the Region of Waterloo Arts Fund. As part of the SSHRCC grant, Esfahani participated in a research/creation group entitled Immersion Emergencies and Possible Worlds: Engaging Water as Culture and Resource through Contemporary Art. Esfahani’s work is represented in public and private collections including the Canada Council’s Art Bank. Currently, she is a lecturer at University of Waterloo and works from her studio at Kitchener’s artist–run centre, Globe Studios. Julia Havard is a PhD student at UC Berkeley in the department of Theater, Dance and Performance studies. She graduate from Harvard University with a Bachelor of Arts in History of Science and Dance and received a fellowship for health policy research at Mount Sinai Hospital in New York City from the Center for Public Interest Careers. Julia worked at Callen-Lorde Center connecting LGBTQ patients with affordable healthcare through the ACA and creating a presentation used to educate communities about access to care, which was also presented at the Lesbian Health Fund’s Annual Conference. She found a dance collective in New York City to explore issues of trauma, body memories, and intimacy through community workshops and performances across New York City and Brooklyn. Her research interests include interpersonal violence, healing and health, and performance as a site of resistance and recovery in queer and gender variant communities. Anastasia Howe Bukowski is currently pursuing an MA in Art History at McGill University. Previously she has collaborated on public education projects with the City of Toronto and has worked in research positions at the Ontario Institute for Studies in Education, Ryerson University, and Concordia University. Her current research interests include contemporary video art, post-digital media theory, karaoke and forms of radical cultural praxis, theories of re-performance and reenactment, basketball and the visual culture of sports, and feminist and critical race theorizations of globalization and transnationalism. She received an Honours BA in Art History and Book and Media Studies from the University of Toronto. Shauna Janssen is an urban curator with a background in theatre and interdisciplinary studies. She received her Ph.D in Humanities (2014), Centre for Interdisciplinary Studies in Society and Culture at Concordia University, where she has also taught in the Departments of Theatre and Art History. Her current research focuses on the cultural politics of postindustrial spaces and urban ruin in relation to themes of public space, the queer production of space, post-humanism, material and performative practices. In 2010, she founded Urban Occupations Urbaines, a curatorial platform for artists, communities and the public to creatively and critically engage with cities and urban change. Since 2013, Shauna co-directs Points de vue, a Montreal based urban activist and community arts organization. She has given public lectures and presentations at cultural institutions such as The Canadian Centre for Architecture (Ephemeral City, 2010), Articule (“Would you be my curator?” 2012), and The McCord Museum (City Talks, 2013). Marcin Kedzior is an educator and journal editor whose artistic practice involves sound, movement, installation, micro-architecture and public space. He received a BFA from Queen’s University, an M. Arch from the University of Toronto and SEED certification from Harvard. As part of AIMToronto, he performed in dozens of experimental sound and movement events. In 2014 he completed several installation projects including “Ground Scraper,” for SPARty at 401 Richmond, “Paper Orbs” for Nuit Blanche Ottawa Gatineau, and “Daniels Spectre,” in the vestibule of the Daniels Spectrum in Regent Park. He is a founding editor of the journal Scapegoat: Architecture | Landscape | Political Economy. He has taught in the Master of Visual Studies program and Architecture Studies at the University of Toronto, is a Faculty Associate at Willowbank School of Restoration Arts, a Professor in the School of Applied Technology at Humber ITAL and occasionally teaches in CS at OCAD U.
Mat Laporte, Sarah Pinder, and Yosefa Raz from the Contemporary Poetry Research Group. Founded in late 2014, CPRG is a loose research collective based in Toronto that is dedicated to creating spaces for engaged dialogue at the intersections of poetry and critical thought. Deborah Margo was born in Montreal, and now lives in Ottawa. She has a Bachelor of Fine Arts from Concordia University and a Master of Fine Arts from Temple University/Tyler School of Art in Philadelphia. Exhibiting her work frequently in Canada, United States and Mexico, she is a faculty member in the Department of Visual Arts at the University of Ottawa where she teaches drawing, painting and sculpture. When the opportunity arises, she writes and curates exhibitions. During the spring and summer months she also works as a gardener. Deborah’s work is interdisciplinary and questions the architectural, historical and social contexts of public and private spaces. Focusing on processes and materials relevant to these different contexts, a conversation takes place between a specific site and the materials she works with. Her working process is both conceptual and intuitive, based on research yet open to so-called accidents. Time, change and touch are key preoccupations. Daniel Marrone holds a PhD in Humanities and Cultural Studies (University of London). In his work on visual culture, he often explores memory, liminal spaces, and the semiotic operation of comics. He lives in Toronto. Victoria Mohr-Blakeney is an independent curator and writer with a focus on contemporary dance and performance. She has curated a series of performance exhibitions throughout Toronto in theatre, gallery, and site-specific settings. Alongside her curatorial work, she has worked as a Dance Columnist for the Toronto Standard, and co-founded the Toronto-based Nomadic Curatorial Collective. Mohr-Blakeney has worked at the CB Gallery in Toronto and interned at the Centre for Contemporary Arts in Santa Fe, New Mexico, as well as the Art Gallery of Ontario where she conducted research into the history of performance at the AGO. She holds an MA from the University of Toronto, and has studied at the University of Havana, Cuba, and the University of Salamanca, Spain, as well as at York University in the Choreography and Dance Dramaturgy program. 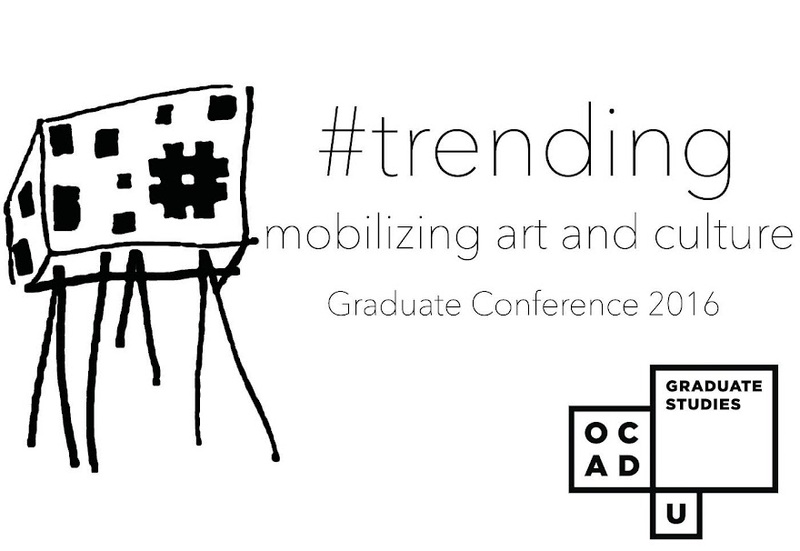 Mohr-Blakeney is currently earning an MFA in Criticism and Curatorial Practice at OCAD University. Rebecca Noone is an artist and a PhD student at the Faculty of Information, University of Toronto. Her quiet, humour-filled interventions interrogate the banal futilities and the muted hopes implicit in our everyday encounters and interactions with information, systems, and technologies. In her work, Rebecca has asked theoretical physicists how they cope with the mundane, compiled maps of hand-drawn directions collected from helpful passers-by, archived detritus in demolition-slated homes, built an interactive library cataloguing system, compiled a mail-based analogue Internet from deaccessioned library materials, and bartered the periodic table of elements at art and music shows. She has contributed to spaces and exhibitions in Canada, the USA, and Europe including Elsewhere Living Museum in Greensboro, NC; NES in Skagaströnd Iceland; The Luminary in St. Louis, MO; Wreck City in Calgary, AB; and the Long Winter Takeover at the Art Gallery of Ontario. Jamie Ranger is an emerging curator, art critic and write based in Toronto. She is currently a fourth-year undergraduate student, majoring in the Criticism and Curatorial Practices Program at the Ontario College of Art and Design University. As a curator, Jamie has worked on the following projects: Simplexity, an exhibition to accompany OCAD U’s inaugural TedxTalk of the same title, Bending the Horizon, an exhibition that celebrate the work of OCAD U’s LGBTQ12S community, and Symbology, a solo print show. Her current research focuses on the development of an ethics of spectatorship applicable to the study of disability performance art. Christian Siroyt is the Exhibits & Programming Coordinator at Museum Strathroy-Caradoc. In 2013 he received his BA from Trinity College in the University of Toronto, where he majored in Book and Media Studies and Literary Studies with German and Cinema Studies. Christian produces films, comics, and literary works from his studio in Strathroy. He is particularly interested in Middle High German literature and the styling of James Joyce. In 2014 Christian established the Comics History Special Collection and the Donald F. Theall Special Collection at Museum Strathroy-Caradoc. He is currently working on two cinematic projects. Geneviève Wallen is interested in issues of ethnocultural representational spaces as a Curator and art historian. Geneviève is a candidate in the Criticism and Curatorial Practice program at OCAD University (2015) and holds a BFA in Art History from Concordia University in Montreal (2012). She is particularly concerned about the platforms prescribed to artists of Caribbean and African descent within Canadian art institutions, and the lack of documentation on this subject. She believes that the inner workings of cultural consciousness not only affect daily experiences, but also shape how individuals perceive themselves and how they perform their social interactions. Her awareness of how different systems of marginalization operate in the art world drives her current curatorial practice and academic research. Nick White is an interdisciplinary scholar and artist whose work interrogates hybrid embodiments, interfaces, and intersections in physical/digital space. He is a Masters student in the Communication & Culture joint program at Ryerson & York Universities and is a Research Associate in McLuhan Studies at St. Michael’s College, University of Toronto. Marianne Fenton received a BA in Fine Arts and then an MFA at the University of Stellenbosch, South Africa. She has exhibited her work in South Africa, London and New York. Marianne is currently pursuing her MA in Contemporary Art History at OCAD University. Her research is focussed on three artists whose works investigate notions of belonging, identity and ethnicity through an examination of English accents. Melanie Girdwood-Brunton is from Montreal, where she received her BFA from Concordia University. Thereafter she worked in higher education, props fabrication and styling in diverse areas, including retail and museum exhibitions. Her research at OCAD University concerns the (re) emergence of the designer-maker, as a multi-disciplinary intermediary pursuing craftsmanship as an ideological position towards labour as self-production. Melanie currently teaches at Sheridan College where she endeavors to instill a love of making in her students. Brittany Higgens is currently an MA candidate in the Contemporary Art, Design and New Media Art Histories Program at OCAD University. Brittany holds a Bachelor of Fine Arts Honors degree from Brandon University with a specialization in painting. Her research investigates questions of representation, the parameters of taste in cultural production and the ideological, philosophical and aesthetic sensibilities of Jeff Koons’ Made in Heaven series within the postmodern and contemporary art eras. Marsya Maharani received an Honours BA in Art History from the University of Toronto. She has held curatorial assistant and coordinator positions at the newly federated University of Toronto Art Centre / Justina M. Barnicke Gallery, the Toronto International Film Festival, and Telephone Booth Gallery. Marsya is currently pursuing an MA in Contemporary Art History at OCAD University. Her research explores the multidisciplinary practices of itinerant artists Vera Frenkel and Jamelie Hassan within the context of migratory culture. Melanie Schnidrig completed her Bachelor of Fine Arts degree at The University of the Fraser Valley Abbotsford, B.C. Her studio practice includes photography, painting and print media. She is currently pursuing an MA degree in Contemporary Art, Design and New Media Art Histories at OCAD University. Her research interests center on the multisensorial and synesthetic dimensions of contemporary immersive installation art. Jenn Snider is currently an MA candidate in the New Media Art Histories section of the CADN Program at OCAD U. Her research, supported by a Graduate Studies SSHRC award in 2014, focuses on art administration within the artist-run centre as a practice of research-creation and institutional critique. Snider explores artist-run culture and organising as performative practice, and as an artist and curator, her work considers the social tensions of collaborative meaning creation and the formation of an ethic of irreverence. Sam Strong is an artist, writer and media theorist. Despite a background in traditional art and literature, he loves exploring the messages and structural complexities in new media and popular culture. At OCAD U, he is exploring the way in which panel structures in comics influence readers’ responses to visual narrative, both semiotically and emotionally.